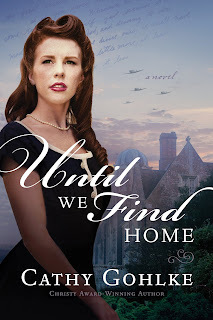 One of the reasons I so enjoy Cathy Gohlke’s novels is due to the time she takes in researching and crafting a riveting tale based on historical fact. Even more so is her note to readers at the end of the story where she shares with such transparency what God has been teaching her through her writing of the book. It should remind us that authors are people too who want to grow in their walk with the Lord and share Him with many via the medium of stories, which is so like Jesus! Cathy pens a very heart-stirring story that depicts different characters from other nations, backgrounds, and experiences during WWII. Claire is an American living in Paris and is helping to get as many Jewish children out of the city before Hitler’s army comes with their death warrants and hate filled regime. Claire’s character has no idea how to care for the small group of children of various ages and beliefs. She has but one hope, that an aunt will take the children in and care for them. Through experiences, choices, other players actions and choices, and a whole host of such heart-gripping moments, a reader will be reading and cheering this ragtag team on! Will these strangers thrown together due to the war become friends let alone a type of family? Will Claire hear God speaking to her and let God in to heal her broken heart? There isn’t enough space to really tell all the wonderful parts of the novel, but I can tell you that it is so very much worth reading! I loved how C. S. Lewis and other authors who lived at that time are part of this book as well as what they wrote for children of all ages to enjoy and let their imagination soar! If Cathy Gohlke is a new author to you, then you are in for a treat! I hope afterwards you will appreciate all that is packed into this tale and leaves you wanting to read her other books too! Take time to sit and enjoy a tale worth sharing with family and friends when you have finally turned the last page.